I feel like apologising for wearing blue again! Looking at My Outfits page I’ve realised that since the cold weather moved in I’ve leaned towards blue, blue and more blue (with a dash of burgundy). But I’m loving this outfit, and another item that’s been in storage is this coat that I’ve been looking forward to wearing again once the weather changes. But the star of today’s post is my lovely little horse brooch-watch from the fabulous Hannah Zakari. I’ve had him for a while but something I hadn’t realised till looking at the close-up shot: he’s got an evil little green eye – looks quite sinister! I can recommend wearing either a pendant or brooch watch on the outside of your coat when winter really sets in; it’s rather handy if you have trouble getting to a wristwatch as I always do when I’m wearing layers and layers of sleeves and gloves. 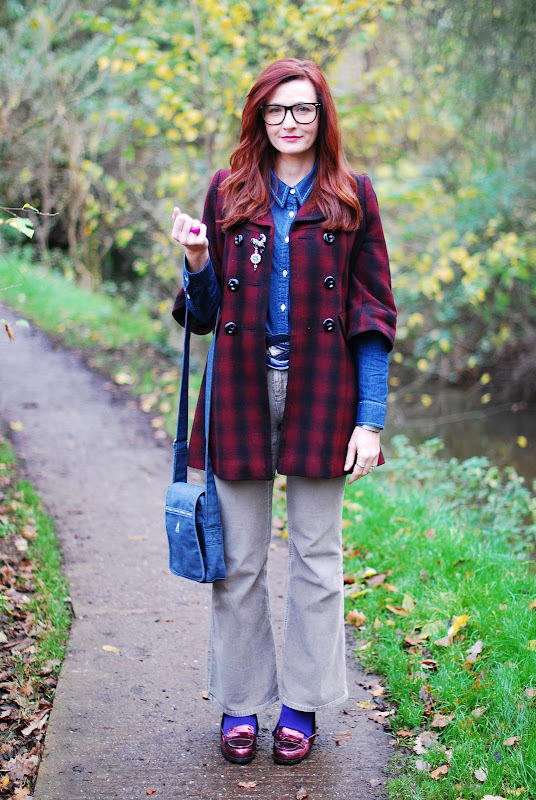 That coat with your hair color and the shirt with your blue eye color is just ridiculously amazing! OMG, you're so cute on the first picture!!! 🙂 nice outfit, btw. 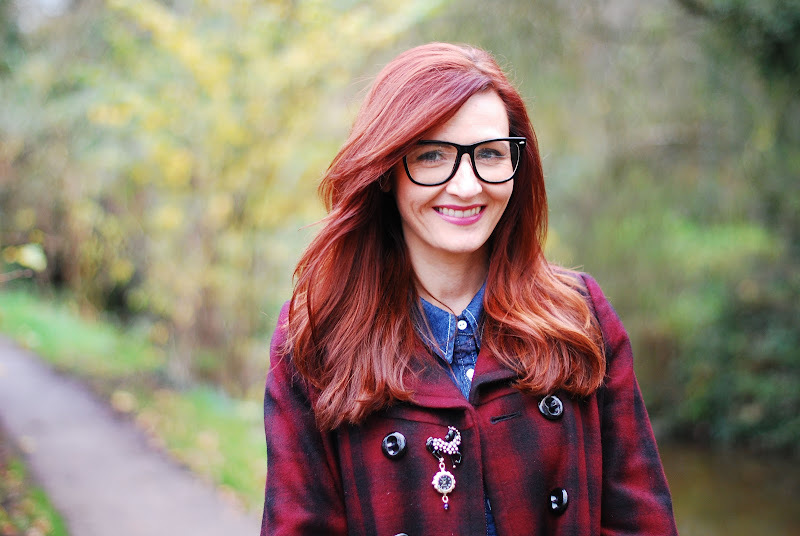 Love your style – would love you to do a Stylish Thoughts post for my blog http://www.insideoutstyleblog.com if you're interested email me and I'll send through the questions. And I love the metallic loafers! I can't believe I've never come across your blog before! You have an aesthetic that I love, personal style with a hint of trends. I'm off to dig into your archives. . .
Um, I am SO SMITTEN with your coat…oh my! I just LOVE it. Looking fabulous…you have the most beautiful hair color. I love how fearless you seem when putting together your outfits! They're creative and seemingly effortless! I'm in favor of green eyes! I just designed a tiger ring and a pair of dragon earrings, both with green eyes. That shade of blue really is your color. And your hair is so beautiful! I have been thinking about some glasses similar to yours. I saw them on many a chicly dressed woman when I was in Paris last year. I am not sure they would be right on my face though. I'll have to keep an "eye" out for them. Aren't I pun-y today? 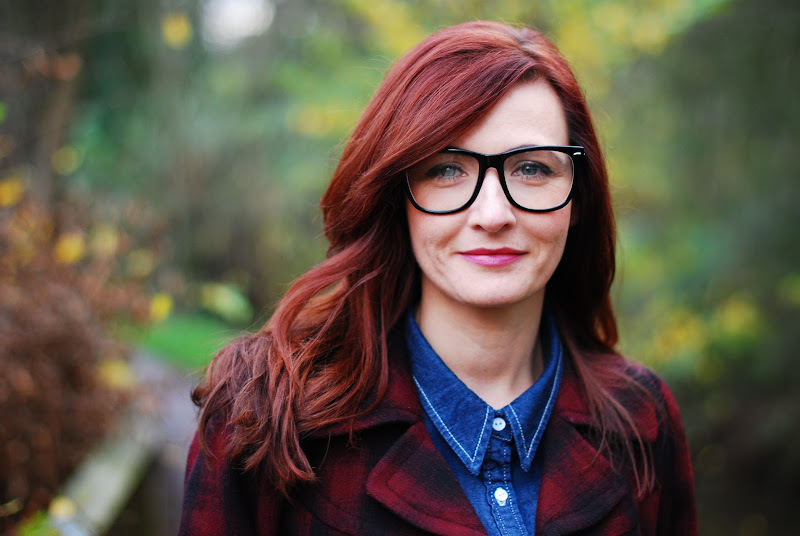 I love your whole look, Catherine – and I had to go check out Hannah Zakari's site – what lovely pieces, at reasonable prices! 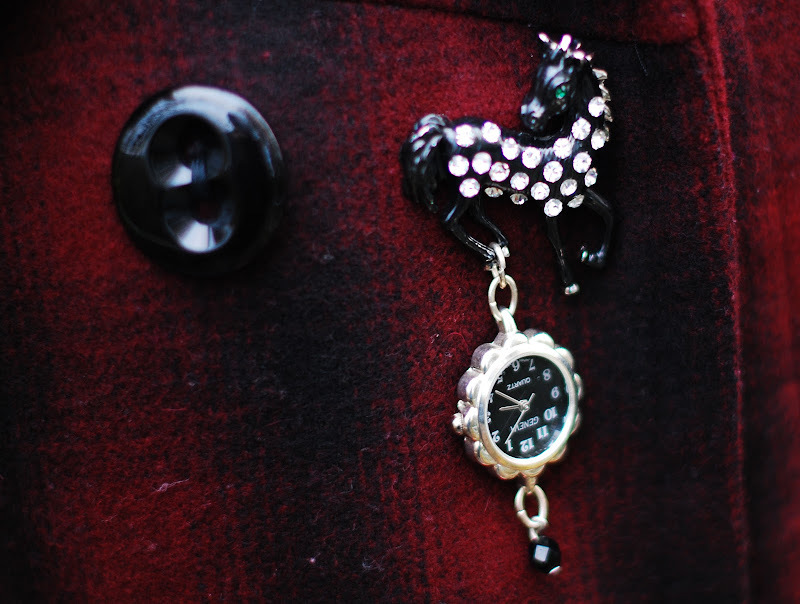 Your horse with a watch is so perfect on your burgundy coat. Thanks for linking up to Visible Monday, have a lovely day!